In a cross-country girls lacrosse matchup Tuesday, St.Margaret’s Episcopal topped visiting IMG Academy of Bradenton, Fla., 15-10 behind four goals from Campbell Case (pictured, left) and three from Maddie Barkate (pictured, right). “Early in the game it was draw controls,” Tartans coach Holly Reilly said. “We’ve been focusing on that; possession is critical, and it’s a very specialized element of the game.” The Tartans never trailed against the Ascenders, but they led only 5-2 after 11 minutes had passed, forcing Reilly to take a time out. That seemed to wake the Tartans up, as they rattled off four straight goals to lead 9-2 and eventually led 10-3 at halftime. The Ascenders, who are only in their second year as a varsity program, didn’t give up. With the Tartans leading 13-7 IMG score back to back goals to cut the deficit to 13-9. But the Ascenders couldn’t get any closer, as the Tartans’ defense, led by goalie Olivia Young (eight saves), only allowed one more goal after the visiting team closed the gap. The Tartans got two goals apiece from Niki Miles, Jordan Miles and Ally Taylor. Grace Kastetter and Audrey Larson each scored once. For IMG Academy, Madeline Ota led the way with three goals, while Tillie Mintz had two goals. 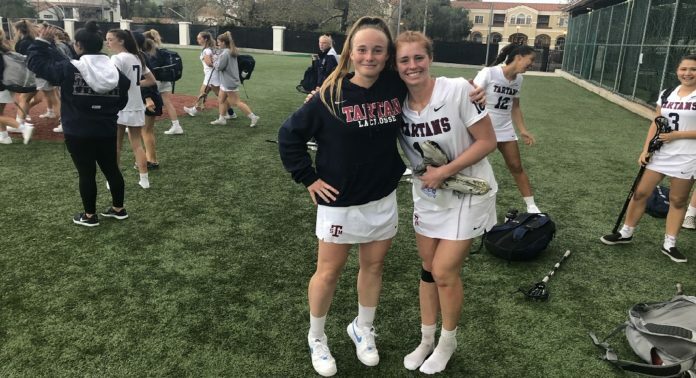 Former Newport Harbor standout Caroline Farley scored once, as did Julia Bowers, Morgan Joseph, Jacelyn Lazore and Mirabella Lazore. The Ascenders got seven saves from Madeline Manahan. “They had some great stickwork and the fact they came back in the second half,” Reilly said of the Ascenders. “It’s incredible that they’ve come out here and we get that competition.” Making her return to California after being an assistant for Newport Harbor’s girls lacrosse team, Ascenders coach Kaleigh Gibbons said she was excited to coach back in California and was excited to see St. Margaret’s again. “I think coaching at IMG is an awesome experience,” Gibbons said, “because having the ability to start a new program and having the ability to grow it. Obviously you have to build it from the ground up, and it takes time, and the only way you’re going to get there is by playing good competition like St.Margaret’s.” After the game, the two teams settled in and had dinner together. In addition to that, both teams also saw the St.Margaret’s boys lacrosse team play Deerfield Academy. Both teams return to action Thursday. The Tartans (4-1) begin the Trinity Two-Step (two straight Trinity League opponents) at Santa Margarita, while IMG (3-6) continues its stay in California, playing at La Costa Canyon.